Welcome back DC Comics' favorite super heroes in packaging inspired by the original Mego cardbacks! Astonishing replicas of classic packaging with awesome figures! Action figures feature cloth clothing, retro styling, and 16 points of articulation. Case contains 12 unique action figures. These figures are ready for action... retro style! 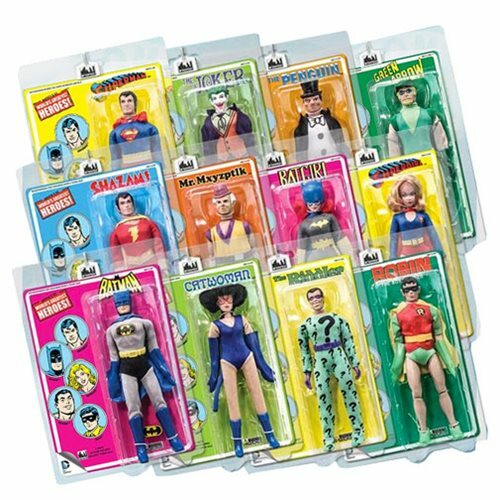 The DC Comics Retro Mego Style Series 1 Action Figure Case showcases classic versions of the beloved Mego-style action figureith packaging to match. Each 8-inch action figure is inspired by their 1970s counterparts, right down to the cloth clothing and retro styling. With 16 points of articulation, you can pose them in just about any heroic position! Ages 8 and up. Each figure comes in a reusable plastic protective case with a full-color backing card. Welcome them to your shelf or toy box today!